I started to call this post “A Little Hair of the Dog,” but I suppose for me this is “Day 3 FanstRAvaganza?” Yes, I’m behind on FanstRA, but do any of you care? I didn’t think so. LOL! Plus, there is so much to read on the blogs that I doubt anyone processed it all in one week. So I’m continuing on despite my interruption. What I’m finding interesting about this last week is it’s becoming clear to me I’m at a place in my life where my ability to roll with the punches is imperative. This blog is certainly a reflection of it. Almost every post I had planned has now been turned on its head. Part of me hates this, but part of me gets a thrill from seeing how well I can bounce back. Now if I can figure out how to channel my zest in a way that’s not chaotic and doesn’t make some of you want to tear your hair out, I will, but I’m promising nothing. This is a significant statement from me as my life is filled with promises that I invariably keep or almost die trying. That’s as closely as I’m going to come to speaking of events this past week which temporarily scrambled my mind. Okay, enough of that. Onto more interesting matters. As some of you know, I’m doing a series of posts about Richard Armitage’s voice work. Last week I started with The Voice. Hope you hang with me as I continue on with the subject. Obviously, the deep tone of his voice is wonderful and many of us get a shiver listening to it. I’ve heard some say they could even listen to him reading the phone book. Not quite sure I would get much out of that. Maybe. Depends on how he would read it. There are plenty of other actors with deep, rich sounding voices that are pleasing to the ear. Alan Rickman is great, and Timothy Dalton has a beautiful voice, and oh so many others I could name, and I’m sure that Richard Armitage would do very well with just his natural voice. But the natural quality of the voice is simply not all there is to this fascination. In fact, if I had heard him only speaking as he does normally in interviews, I doubt I would have been this ensnared by it. No, this is something more. It is the way he intentionally uses it that’s so mesmerizing, and I don’t like to toss around words like mesmerizing unless I mean them. Recently, I saw a picture of him where his luscious beard is gone, but contrary to what some think, that was never the significant wow factor in the Hobbit press conference. Granted, the beard was pretty overwhelming — almost with a life of its own. :D But it was not more compelling than his demeanor, which was mostly effected by his voice. He pulled a Harry! “I’m playing Thorin.” LOL! I think his voice dropped almost an octave when he said Thorin, and then he does it again when he says, “Would you like to be a little bit more specific?” I wish I could have seen the reporter’s face when he whipped that on her! It was like a snake charmer with his flute trying to cast a spell over something that might bite him. His mimicry in these books is great. I love how he conveys one character with a guttural tone and then turns around and gives another character a tinny, almost flat resonance, and every variation in between for a host of other characters. This did much to paint the picture of them with little or no dialogue or description. But I also had some idea of characters from watching the show and was never quite sure how much that affected the picture in my mind. It was listening to his reading of a Georgette Heyer novel, Sylvester, that I realized how very talented he is, and that’s saying something as I was never a fan of Regency Romance books. I tried to read them as a teen, but the potential sugar shock was too much. So it was with great reluctance that I listened to Sylvester. I’m so glad I did! His verbal rendering of the characters had me completely forgetting the book is Mary Sue on steroids. When I finished the first hearing of it, I had a grin on my face I couldn’t wipe away. For five hours I had been immersed in Regency England where I thoroughly fell in love with the characters and literally had to shake my head to bring myself back to the present. Of course I loved Sylvester and Phoebe, but it was the supporting cast that really made the piece for me. Tom was my favorite with Keighley and some others close behind. The most wonderful part of listening to the book was afterward I could see Richard Armitage as a little boy with his ears cocked to listen to those around him and then using it to entertain his friends and family with storytelling. It brought such a warm feeling to think of it, and all at once I sensed a great kinship with and fondness for him. I couldn’t help it. I grew up with a mother who’s a performer and has a wonderful gift for it. I, on the other hand, never did, but I still adored storytelling and role playing and ended up with SO who has been storytelling and doing voices to entertain friends and family since he was very young. His children are just like him! My oldest child cannot be around someone for any length of time without picking up his/her speech patterns, and it’s eerie how truly she can nail someone’s speech. Her ear is so attuned to how someone speaks that she sometimes has to restrain herself from mimicking them. My other children do this as well, and I have been the recipient of many hours of entertainment because of it. It’s almost as if they have to express the things their ears are recording to get some relief. All of this ran through my head as I sat there basking in what I’d just heard, and I realized that I didn’t merely appreciate Richard Armitage as a great actor but as a wonderfully sensitive person –much more than I had originally thought. How else to account for someone who could so cleverly convey the feelings and thoughts of his characters with little or no speech, and now he had done it with only his voice?! Amazing. I love that interview. It is one of my favorites. I was already anxious to listen to Venetia, but after listening to that, I could barely wait. Venetia is probably my favorite Heyer heroine of the three books RA read, and Damerel is wonderfully male. I was so glad I wasn’t driving when I got to chapters 12 and 13. :D I have also listened to The Convenient Marriage, and until recently, all three books were on my iPod as beloved traveling companions. And whatever is the case with his training, the joy he takes in entertaining is evident and infectious. This puts a smile on mine every time I see it. I think it might now be my favorite picture of him. Note: Guy of Gisborne is such an enigma that I’m refraining from much discussion of him in my series as he would completely take me off topic. Thankfully, other bloggers have chosen to write about him. Avalon at Avalon’s Medieval is covering a myriad of topics from the audio books to fan videos to fan fiction. Two other bloggers are actually fan fiction authors: Prue Batten at Mesmered’s Blog has written Gisborne and Sarah Pawley at From the Quill Tip has written The Tempest and My Lady Gisborne. Both share their stories on blog and Sarah also highlights some other fan fiction authors. I have read both Prue’s and Sarah’s works, and if you’re a Guy fan, you will not be disappointed. Even if you’re not a Guy fan, you probably won’t be disappointed. There are also some North and South fictions featured on Sarah’s blog. Judi is a fairly new fan and should be forgiven for not knowing every jot and tittle of fandom minutiae. We’ll give her a test later. :D I honestly didn’t snap to on the award for Robin Hood until right before I posted this, and I’ve been through hell trying to post, so I wasn’t going to wait, and I absolutely love her recording. But heck, I think the show should have won an award. If nothing else, RA should have won for making such a compelling character from that cardboard cut out baddie. But take pity on Judi as she’s still trying to work out her fascination for Guy of Gisborne. LOL! You can take the journey with her beginning here. 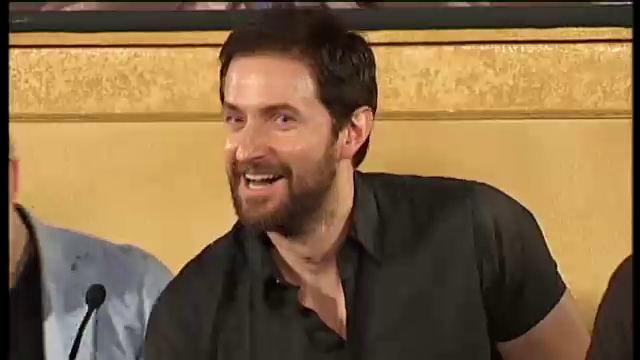 I have had a lot of fun listening to RA. He is a great companion in the car. I did not originally expect all of the voices he can do but he is great at them and I have a good laugh with most of them. Thanks for the Venetia interview. I have not heard it before. Well, let me be the first to comment. I think you know I am a bit of a mimic myself so I would fit right in with your family, RAF. I used to tell my older sister stories imitating different kinds of voices–hey, I was cheap entertainment back in the Dark Ages! I do see Richard’s voice as a musical instrument expertly played by its owner. There are times when he sends a shiver down my spine, when he thrills me in a way I never imagined an actor could do, when he breaks my heart, when he lifts my spirits in an amazing way. His voice is aural chocolate, and honey and velvet . . . yes, there are other actors’s voices I like, such as Alan Rickman and Timothy Dalton, but none seem to affect me the way his does. And you know this man just loves what he does, don’t you?? It’s great to see that smile and the merriment in those beautful eyes . . .
Ah. Frenz, you are so right – we’re far from tired of the subject of FanstRAv2011! Thank you for for the Richard voices. I read to younger brother and sister aeons ago, from Winnie the Pooh, with voices for each character. Kanga had some imagined variation of an Australian accent, probably something that real Aussie’s would not recognise. Much later, my husband and I read to son every night from the TinTin series, adapting our voices to Captain Haddock, and the rest. Son, as a result, was reading himself before he was five. Never underestimate the power of the Voice! I love how Richard makes all of the characters that he plays into very different people, using his voice. His characters are people in their own right, not simply a slightly altered version of RA himself. The way he uses his voice, allows him to completely transform and become someone else every time. I have never had the pleasure of listening to one of his audio books, but I’m sure I would thoroughly enjoy them! Thanks for sharing the Venetia interview – it was completely new to me. Not sure that the tranformation was complete at the time, as ‘RA’ did come to the surface a few times, but I could definitely hear someone else in his voice. Glad you are back. You didn’t mention the poetry – I’m addicted to the poetry… PS Don’t enter me in any audiobook giveaway because I already have them all. That’s only the first part of the Venetia interview. I’ll post the second part in another post this week and there is also one for The Convenient Marriage, which I’ll also be posting. I’ll also tell you how to get a copy if you want it. Going to work on that PSA some more tonight. Springtime is here and Angie is due to lose her voice again . . . I always love listening to his interviews on the audio books (well, on everything, really). So insightful and his intelligence and humor shine through. Of course, the bonus with filmed interviews is getting to see him talk with those lovely hands!! Thanks for this great post. I’m looking forward to hearing The Convenient Marriage interview. I had listened to the Venetia one a while back and it was great to hear a bit of it again today. So, I have a little story/confession about my addiction to RA’s voice. A couple of months back I had to undergo surgery (again). And I was a little more nervous about this one. But I was allowed to keep my iPod in the prep room with me. I listened to The Convenient Marriage and it calmed me down so much I seriously thought they had already put some warm-fuzzy drugs in my IV drip. When it came time for the operation, the anaesthesiologist discussed my options and long story short, we agreed that I would get a Rachidian (spinal) rather than general anaesthesia. Of course he told me he would give me some sleeping drugs too so I wouldn’t have to hear what they were doing but I was so nervous those wouldn’t work enough, I asked if I could keep my iPod and he said yes. So how happy was I to listen to RA as I was being wheeled into the operating theatre? I of course passed out rather quickly with the meds they gave me, but there he was still talking in my ear when I woke up a couple of hours later…. The weird thing is I was now listening to an MI-5 Season 7 episode. Not sure how that happened. Did I wake up, change it to MI-5 at some point or did some nurse take my iPod off while I was undergoing surgery and put it back on after (with MI-5) but either way I was a very happy camper indeed – and very calm. Ah, the powers of that man! I’ve always had trouble with confidence so in my teens I both joined a church choir and did drama and speech lessons. They were good times and I gained a great deal from them; but one of the things I treasure most to this day is the knowledge that the voice is an instrument. I’m not the world’s best singer nor would I make it as an actress ; but I know about breath control, expression, colouring of words and feeling the shape of them in your mouth. RA is one actor from whom I really get the idea that he explores what his voice can do and takes pleasure in using it. There’s a sensuality in his use of words and the tone and pitch of his voice. the acting and audio books. He knows the power of words and the fact that when you use your voice as it should be used then that power is awesome indeed. They say the pen is mightier than the sword and I agree with that; but I reckon that the tongue is even mightier still. Imagine sitting and reading one of Shakespeare’s Henry V rousing speeches. Stirring stuff indeed; but get a master actor declaiming those lines and that’s when you really get the hairs on your neck standing on end. We have a CD somewhere with William Walton’s music from the Lord Olivier film of Henry V and Kenneth Branagh doing Henry’s speeches. Wouldn’t I just love to hear RA doing that ? With the BBC Philharmonic doing the music. ( Ooops sorry. I wrote.an essay there ). Great to hear judiang’s voice and the voice of RA as well. He’s a magnificent storyteller, making those audiobooks really stand out. You can’t help but to listen to every single syllable. What a great gift! Really enjoyable post and I’m glad to see you back, Frenz. :) Continuing F2 a little while longer? Well, I had a few more posts I wanted to write but didn’t have the time to … haha, when will it end?! Truly, his voice is my favorite part of watching him. As beautiful as he is, if I had to pick between watching him and listening to him, I would pick listening. I hope you take this the right way, but you remind me of my mother. Not in the maternal sense but that she’s larger than life. I wasn’t kidding when I said she’s like Mame. LOL! Oh, I agree heartily! SO talked to our children when they were in utero. I think it made a difference. Seriously. I talked to them too, but not like he did. LOL! Welcome, and I FINALLY got this posted. LOL! AmandaJane, I know the speeches you’re talking about. I would love to hear that! I would love to hear him do more Shakespeare than wee bit I’ve seen. Christine, I’m going to explore that aspect some more! IngeD3, Oh, no kidding he was channeling Thorin. I just loved that! It really made me anxious to see how he’s going to do the character. Judi, I love your recording. Is the phrase “tall drink of water” used anywhere other than America? I really don’t know. I loved hearing your story, Judi. If only you’d stuck around long enough to get to the Dark Knight once Justin Beiber with Scruffy Facial Hair got out of the way, think of how much earlier you could have crushed on RA!! Mame is one of my favorites! And I am delighted to be compared to your mom. :D You need to meet my oldest sister. She is much more outrageous than I am . . .
Really great post, Frenz!!!!!!! Really. Wonderful! Angie, your sister is more outrageous? Ohmygosh! LOL! Frenz, we’ll be high on RA and FanstRAv till The Hobbit is released. Very happy you’re here this week, to carry on the thrills. If there’s one more question I’d like to ask Mr. A, it would be to explain his perceptions of the relationship between his musical ear and training and his vocal expression. Seems obvious, but it would be interesting to hear his considered word. Judi, I feel I know you that much better from your voice. Nice! Why does everyone SAY that when I tell them Deb is more outrageous?! (but she is). @fitzg, so glad you shared that. It’s in my next post. LOL! Seriously. I used to be really shy. But I got over a lot of that. *grin* So did my sister, come to think of it. Hmmmmm . . . Considering how sick I usually get from the anesthesia, Richard Therapy sounds so much more pleasant! The next best thing to having Dr. Track at your side, holding your hand . . .
What can I say about his voice? I adore it (as anyone else here ;)). I don’t have all Georgette Heyer’s audiobooks but I think The Lords of the North is his best audiobook. I love it. Thanks for the chance to win one of the Georgette Heyer’s audiobooks!. Hoping this is the lucky entry! Hi Frenzy, thank you for the excellent analysis of RA Voice in your post! I totally agree with you. I got the first glimpse of RA charming voice on the internet, looking and listening to North & South youtubed by a generous friend, as there is no possibility to have this production showed on TV in my country (sigh!). I simply got mesmered by his voice at the love declaration scene, how he masters bass tones perfectly and charmingly. Yes, he can tune his voice to his purpose even in everyday life (press conference), as he is an excellent actor and as only a self confident man can do. I only started the audiobook experience a couple of weeks ago with “The Convenient Marriage”, in order to practice my English too, and I must say I have to avoid doing other things while listening to RA voice, otherwise I completely get lost! BTW, my English is improving every day, thanks to Richard wonderful voice and characters on DVDs and audiobooks! LadyCassia, your comment reminds me to proof read myself more carefully. It doesn’t help those who are working to perfect a second language, when we are making typos. Your English is very good. I love to listen him in Clarissa, (which I have by the generosity of a lady blogger :) ). Often these are the only sounds that I can listen, after a noisy day in my office, even though the story of Clarissa is very sad. I agree with fitzg, your English is very good (it is not the easiest of languages to learn) and what a wonderful way to improve it–through listening to Richard’s beautiful voice! Richard provides not just entertainment, but education and inspiration to so many through his use of his talents and gifts. There is really something magical about listening to him. He was wonderful in Clarissa, which indeed was a very sad story (that’s why I had to turn Lovelace into a more sympathetic and redeemable character in a fanfic). I loved being read to as a child by my older sisters and later I got to read to classmates on many occasions. Late in my mother’s life I read aloud my articles and columns to her. That was very special to me. I hope you will be able to get The Hobbit in DVD form with his original voice so you can truly enjoy that, too. I am also very eager to see him as Thorin. I think he will do a spectacular job. I’d love to win The Convenient Marriage, as many fan have told me they love that one. Although there’s enough praise for Sylvester and Venetia going around as well! If only RA would do an audio book of North & South – I’m sure that would be my absolute favourite!! I’ve been listening to the Guy voice for the last two days, and have got all excited all over again at how RA used his voice in RH. Perfected it, I would say. Ah, to have that voice in my ears in person! Of course, it would probably be too much for this poor old heart, but if so, I could just float right up to heaven on it! Seriously. Sigh. I’ve been tempted by them for a while now, but I’ve never tried audiobooks before so haven’t made the leap yet! 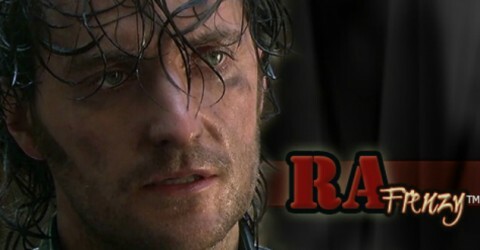 @Bonnie, I was not an audio book lover, but I adore RA’s books. You will not regret making the leap! @To everyone who does not speak English as a native language, you have humbled me. I can understand and speak a little Spanish and French, but I would not call myself fluent. I am so impressed with all of you. Please don’t feel funny about commenting. You’ve actually inspired me to get up to speed on my Spanish. I will try to post my next piece today, but I’m unexpectedly going out of town, so hopefully, that won’t create an obstacle. I’m still getting the hang of posting from my phone, so if I hit a snag, I probably won’t post until very late tonight when I arrive at my destination. I’m just glad I got that last post out which was a feat to get done and then post from the phone. Phew! LOL! And I am impatient as well when it comes to hearing/seeing/reading about RA, so I totally sympathize. Thanks Frenz – lovely to hear Judi’s voice! I have all RA’s audios to date so no need to enter me into the competition but would love him to do more audio work. I remember my daughters’ singing teacher saying that the voice is an instrument – it takes training and talent to use it well. I believe RA has this gift. In my former job with blind/vision impaired children, part of our orientation was a tour of the ‘talking books” studio. Hundreds of people audition to read books for audios but only a few are accepted. This is because the readers’ voices and style must be of a certain high quality that will be assured of pleasing all audiences. A voice that “grates” on the audience can ruin the book. RA I believe does justice to the books he reads – he is easy to listen to, and this should appeal to an audience of any kind. Didn’t he use the German accent in one of his CBeebies bedtime stories? Otherwise my compliment on your topic, his voice is really remarkable and he sure knows how to use it to the max, so that the audience is indeed most pleased! I love Richard’s voice and I love how he plays with it, as you said in this post. I love in particular when he drops his voince aqn octave to convince you of something, like in the interview. It does give me shivers. I am also fascinated how he is able to keep all the voices going and never falter for a whole audibook. I am truly amazed by this. I have to admit that Richard inspired me to read to my kids in different voices and built in surprises just with my voice and they love it! But I also noticed how hard it is for me to stick with the made up voices of the characters. RAFrenzy: am really enjoying your posts on RA’s voice – and am grateful that they are prolonging the delight of the FanstRAvaganza! Would love to win one of the audiobooks since I was a great fan of Heyer as a teenager and it would be fascinating to hear RA bring them to life. Your audio topic makes me speechless (and cold nr. 4) ! Thanks for posting this. It’s fascinating to find out where and how Richard comes up with the different characters and their voices. I really appreciated his comment about not stereotyping the characters. This man is great at being really detailed in all of his works. I’ve read several of Heyer’s books and think it would be interesting to hear RA bring these characters to life. Thank-you for this opportunity and also all you do to aid my RA fix!!! A chance to listen to RA whenever I want? Sounds good to me!! What a lovely giveaway! I listened to the interview with RA and I appreciated his voice anew. When you have only the voice, you are not distracted by the face and figure :) And he sounds like such a charming and thoughtful man. I would love to win the audiobook–thank you! Lesley, It’s amazing how we do not need to see him in order to enjoy him! But of course I never want to give up seeing him. Ohh, his voice makes me all swoony in films/tv, but I haven’t tried his audiobooks yet. That would be so awesome! He sounds as good as he looks, which is high praise for both his voice and his looks! I’m a relatively new RA fan. I’ve seen North & South (many, many times) and the Vicar of Dibley episodes he was in (a few times, and only those episodes). I have Robin Hood on my queue, and will have to check out his other work as well. I’m also a new Heyer fan. I read one of her books, The Grand Sophy, last year, and absolutely loved it. I’m less familiar with the world of audiobooks – to be honest, it’s never been very successful for me. I haven’t been able to find narrators I’ve connected with and so I get easily distracted. But Richard Armitage? I could listen to him forever. I have Venetia and The Convenient Marriage but I would love to have Sylvester or any of the other Robin Hood related audio books — or anything else RA related as a matter of fact! Thanks so much for doing this giveaway! I was always wondering while listening to RH audiobooks, how he changed his voice so differently creating so many dissimilar characters. Sometimes I can’t even recognize him. That’s a talent! As for me Richard’s voice is not just The Voice. It is one of the strongest incentives which made me wanna go on with learning English. When you see such a man and hear him speaking you simply want to know what he is talking about. And I know many people for whom The Voice was the same stimulus. Richard’s voice is like a tool which he uses as well as his actor skills. It’s like a perfect combination of all components. Ok! I’M HERE! *deep breath*. I’ve read the post and all comments. Couldn’t you let me something to say? All right. I know. I’m late. I can’t see how everyone use Richard voice to calm down, smile, escape, cheer up… Why doesn’t doctors prescribe his voice instead of drugs? “Hear him three time a day. After go working, before take the bus to come home to the job and before go to sleep”. I’m sure most of you would enjoy his natural voice but I think that’s too work for an only man. Of course, if that could be possible I’d be the first one. Everybody highlights his great intrument (voice) and his talent to play it. I agree he has an incredible voice but I so sure about his talent that I’d be very surprised if he hasn’t been able to modulate as he pleased. I’m fascinated but not to surprised. Finally, I very sad because, as same as Maichi, I live in Spain and we have the bad habit to dubbing all film. What does that means? We won’t be able to hear Richard himself until Sept. aprox. on ‘Captain America’ (DVD). I don’t want to think about how long will be for ‘The hobbit’. Acting, dancing, singing, play music… How many other hidden talents could that man have? I apologize for torture your language. My beloved new second language. Thanks for your blog Frenzy. I enjoy it a lot although I don’t comment. I’m lucky to meet you. And Antonia, I’m lucky to meet you too! One year ago I gave up watching cable. After reading none stop for 6 months I decided that I could risk a little TV (not cable of course) and decided to purchase a mini-series to watch at home. Contemporary programs are not really what I am drawn to as I want sheer entertainment, boundless imagination and a sense of wonder when I sit down to watch something. I want to be swept up in emotion; good or bad and I want to believe that ‘that moment’ could be my life – even if only for the briefest of seconds. That coupled with the fact that I was born in the wrong century and my complete addiction to an english accent helped make my decision for me… Robin Hood The Series it was. Imagine my surprise when I discovered that Robin was NOT the reason to watch – how could he be when Richard Armitage was there – and then came North & South. In a world so full of sounds Richard’s voice rings out over everything. His voice conveys every level of emotion so effortlessly, it can go from a shout to a whisper in a single breath. It makes the spoken word so powerful – even 2 simple words like LOOK BACK!. When I hear Richard’s voice, I listen. I listen with all of my senses. When he speaks I live for his voice and when he is silent I am happy to just look. In so short a time I have become hopelessly addicted to the sound of his voice, not to mention the curve of his jaw, the intensity of his eyes and the haunted look he seems to have. Richard Armitage makes me happy and that makes my days better!